I am Sunday's Milan Dragway Nostalgia Comp Eliminator champ. This year it was a three day event with separate races on Saturday and Sunday. 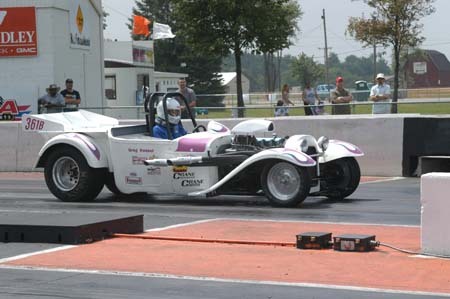 My buddy Dan Snyder (552 ci Ford powered '23T altered) won yesterday's race and me today. In the final round I had to run a FED (8.50 index) on my 10.50 index in the Last Logghe altered. He ran 8.52 to my 10.52 with a m.o.v. of .016. What fun! This was with the (orange) Logghe vintage race car - not my avatar S/P. Last edited by THE FRENCHTOWN FLYER on Wed Sep 27, 2017 2:52 pm, edited 2 times in total. Outstanding! Enjoy nostalgia drag racing. Go to Beechbend just about every year for the NHRA museum eastern tour. Thanks for the video! Wow nice run Greg, the "Last Logghe" is very consistent! Congrats on the Win. I ended my 2017 racing season last night in the Last Logghe altered. After my successful outing a couple weeks ago in Nostalgia Comp I decided to enter the monthly Heads Up! night race last night. It was my first time racing at one of these hugely popular Heads Up! series. I entered in the Open Comp class - no electronics, .500 Pro tree, qualify off your reaction time, dial-in assigned for the evening as 1/10 faster than your quickest of two qualifying passes. 71 cars trying for a spot in the 56 car qualified field. On my second pass I had a .007 light, ran a 10.51 (lifting) and that put me in the show at number 12 qualifier with a 10.41 dial-in assigned. Ran dead on 10.41 first round, won a couple of rounds, lost in the third, won back my $50 entry fee. What fun. I know I took some flak from some by deciding to update the Last Logghe altered to current safety specs and other mods instead of making it a restored, as-purchased original. But in the course of racing it these last few years many folks have thanked me for putting it back on the track and letting them remember what these cars were like. It pleases and surprises me to see how many people remember the names of Ron and Gene Logghe, Chuck Kurzawa, Al Bergler - all craftsmen associated with its construction. Purists love the original inline six. Post race leak-down and compression checks showed everything good and ready to go next season so it gets winterized and put back in storage 'til spring. Thanks for following my thread. Stay tuned for more fun next summer. Good job on the season. Logghe Brothers Stamping , custom built the coil overs for me , for my turbo six mustang...about 40 years ago! The coil overs on the front were custom made at Logghe also. They cut down longer bodies and shortened the stems for a compact unit. They were wizards. 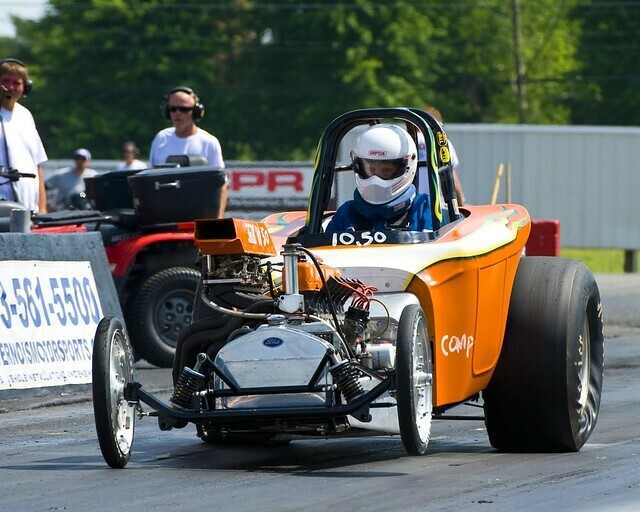 THE FRENCHTOWN FLYER wrote: thanks drag-200stang. It was ahead of its time, but not so much any more. We took two cars to the Nostalgia Drags to end our 2018 season. The orange Last Logghe altered qualified #1 both days. Ran 10.50 on our 10.50 index both days. Saturday it would not start for the second round. We found a loose connection in the coil circuit and rectified it for Sunday. Made it to the semifinals where I took a nap on the start and lost. The white Family Truckster also made it to the semifinals on Sunday with my buddy George at the wheel. It slowed down a tenth on that pass so we have to see if something is amiss before next season. I upgraded the brakes on it from old, problematic Hurst/Airheart units to Wilwoods. It really made the driver feel comfortable and more confident this weekend. Had FUN. Made friends. Talked with lots of Ford six fans. That's important.